Jason N. Gaylord is Director of Technology at United One Resources, an app developer, blogger, Microsoft MVP, and ASPInsider. 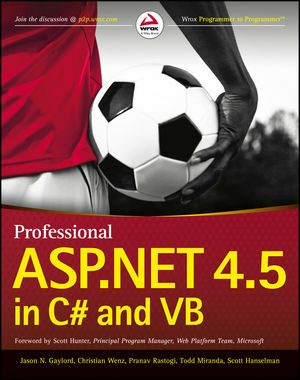 Christian Wenz is a consultant, trainer, author, ASP.NET MVP, and ASPInsider. Pranav Rastogi is a member of the Microsoft ASP.NET team, web developer, and speaker. Todd Miranda is the owner of NxtDimension Solutions and a consultant, trainer, and Microsoft MVP. Scott Hanselman is a web developer for Microsoft, has a popular blog and podcast, has authored many books, and speaks globally. In Chapter 5, some Listings read: DayNumberText ="25"